For many industry professionals who work in electrical or air conditioning related jobs, plenum rated cable ties are a must have. These special fire resistant cable ties are often required by the NEC (National Electrical Code) in air handling spaces like air conditioning ductwork. Plenum rated burgundy cable ties can also be used above drop ceilings and below raised flooring where fire resistant zip ties are needed. At ZipTape® Label ID Systems, our air handling plenum cable ties meet UL 62275 standards that previously required Halar® or Tefzel®. 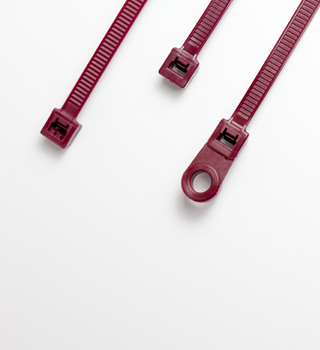 If you would like more information about our burgundy plenum rated zip ties, please contact our knowledgeable customer service team who would be happy to answer any questions you may have. Plenum rated cable ties can be used above drop ceilings and below raised flooring where fire resistant zip ties are needed. The plenum rated ties are UL 62275 certified for low smoke and low heat release. Do you need resistance to chemicals, radiation or extreme temperatures, the Tefzel® ties are the answer. 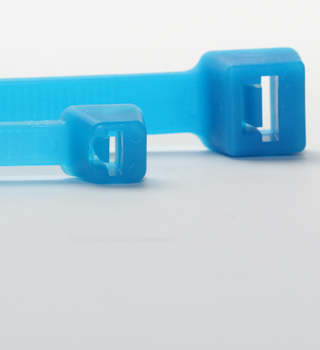 Tefzel® cable ties can also be used for bundling cables or wires in plenum rated zones.